Published on February 13. Updated on June 20. 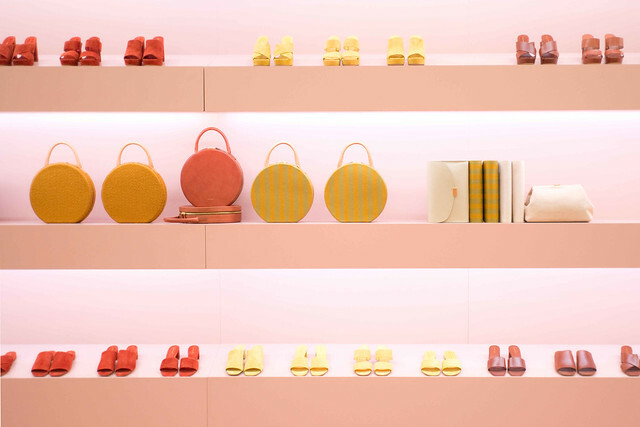 Mansur Gavriel isn’t stocking its own web shop until March, but you can find their SS2016 collection at a number of sites. Though you’re not getting a pink box, many of these sites offer returns. Buying directly from MG is final sale, which I learned the hard way, and they also charge shipping. The biggest perk of buying direct from MG is the selection. Shoes in four styles and five heel heights, in many colors. Sorry, none of these appeal to me. And you may have heard about the drama. The shoes pre-launched at Net-a-Porter two days ago, which means you can trust there will be plenty of popbacks. New bag styles: the Moon Clutch, the Flat Clutch, the Volume Clutch and Circle bag. New bag size: mini Lady bag. It looks substantially smaller than the regular Lady bag. Mini dimensions: 9″ x 10.5″ x 3.5″ vs regular dimensions 11″ x 12.5″ x 4.5″. The handle drop differs by 2″, which means the mini top handle won’t fit on your shoulder. Both have a crossbody strap. New color: Rococo (dark berry pink) and Blush (between the existing rosa and peony). Personally, I am not interested in the new colors, shoes, or new bag styles. I like the lady bag, but not sure if I like the mini or regular size, or if Barneys will have the mini in saffiano. 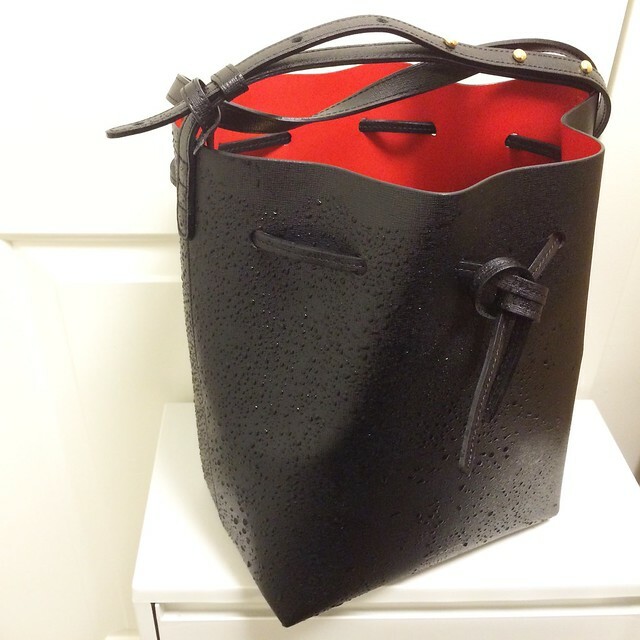 I’ve been using the Mansur Gavriel bucket in saffiano leather pretty often since I got it in late October. (Second runner-up is the APC textured half moon crossbody.) I also have reviewed the mini bucket in saffiano and mini lady bag in brandy; both were acquired after this bag. The simple design and almost invisible branding. It can fit a lot — including a work folder full of papers — and is great for traveling. I used it for a recent overnight trip and it fit my electronics, toiletries, and a change of clothing. The exterior saffiano finish is super durable. I can’t find any signs of wear. 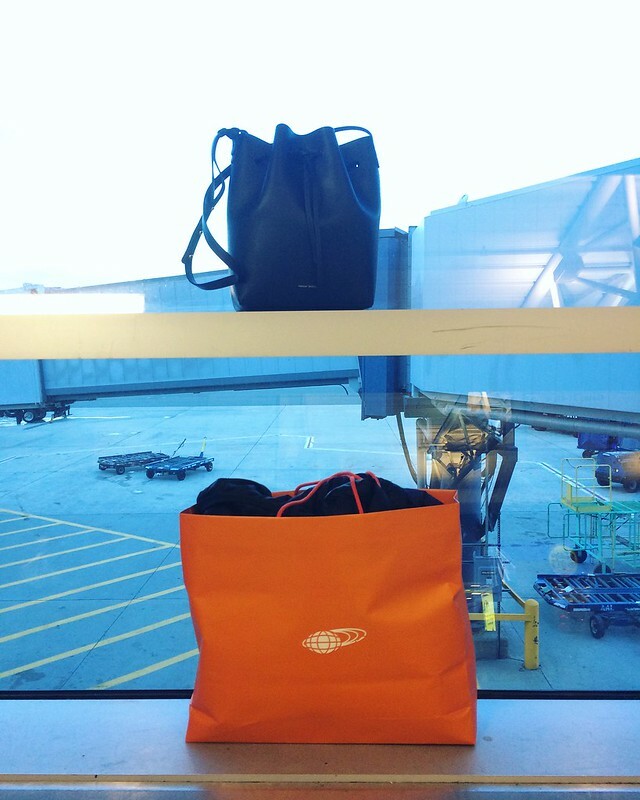 I rarely baby it — I wiped it down after a rainstorm (the umbrella was useless) and I wrap it in a regular Baggu nylon bag before I shove it overhead or under the seat on the plane. I don’t mind putting it on the floor in certain places (but would never do that with many bags). I hate zipping/closing bags in general. There’s comfort in its depth. It’s lightweight. I really hate when empty bags are heavy and excessive hardware. I can carry it comfortable on my shoulder and crossbody. I’m exploring the bucket bag — not totally convinced yet. 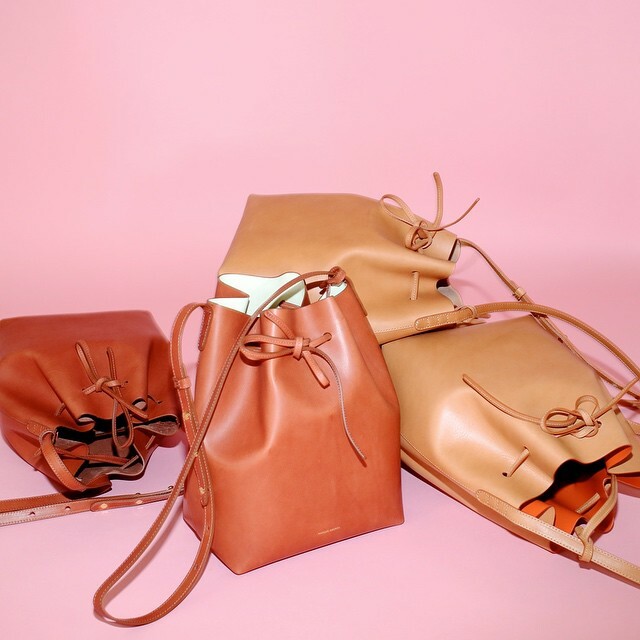 Of course, it’s Mansur Gavriel’s signature/coveted bag but after a few days of stalking the sites below, I have in hand a coated large bucket bag in sand/sand. There are many color, leather, and size variations (mini mini, mini, and large), which breaks down the ubiquitousness of the bag. While the vegetable tanned leather is more delicate, it is great for breaking in and developing a patina if you’re looking for character. There are a ton of reselling sites that have these bags already broken in and for under retail too, if you’d like: eBay, Poshmark, Tradesy, and TheRealReal. These sites also give you a sense of how these bags wear. The coated leather appears to be durable (TPF review) and lightweight and I really like the sand color. As an anti-bag zipper, it can be worn close enough to the body and deep enough to carry whatever I may want to carry.